Topstone Software Consulting uses both the Spring framework and Elasticsearch in building eCommerace applications. Faceted search is a core feature of most online shopping Web sites. Search facets with an associated count. 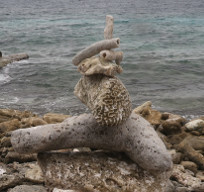 Some websites display the categories (facets) with an associated count. This can be seen in the screen capture from an online clothing retailer. If a category has a large number of items associated with it, this tells the user that they need to use more detailed selection to find the items they are interested in. Often unstructured search is used to find an item on a retail website. For example, if you are searching for a "G8" LED bulb to replace a halogen bulb, you might search for "g8 led bulb" instead of trying to find the Amazon category for LED light bulbs. When designing the system architecture for an online shopping site, a database should be choosen that supports both faceted search and unstructured search (the search for the "G8" LED bulb). The Book Search demonstration application shows how the Elasticsearch database can support both faceted search and full text search. Elasticsearch is built on top of the Apache Lucene database, which has powerful full text search capabilities. Elasticsearch is an open source (Apache license) database that is built on top of the Lucene full text indexing system. Elasticsearch is a scalable database. When running on a base AWS Elasticsearch Service instance, this application uses a single server. For larger data sets or as the data requirements grow, the Elasticsearch Service instance can be sharded across multiple processing nodes. Distributing the processing load across multiple processing nodes allows the Elasticsearch Service to rapidly deliver search results for very large data sets. 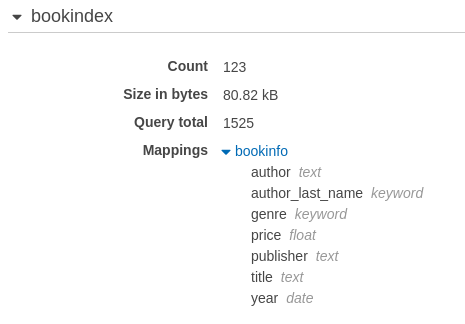 The Elasticsearch index for the Book Search demonstration application is shown below. The name of the index is bookindex. The name of the type associated with this index is bookinfo. The text fields can be searched for arbitrary strings. For example, searching for the word "venice" in the bookinfo "title" field will return all of the bookinfo entries that contain the world "venice" in the tile. Searches within text fields ignore character case. This type of unstructured text search would be used to find the "G8 LED" light bulb on an online shopping site like Amazon. The keyword type defines a field that is searched by exact match. Searches on the "genre" field must exactly match the strings in that field to return a bookinfo element. For example, a search on "Science Fiction" and a search on "Fiction" return different data elements. For keyword fields, character capitalization matters. Some fields, like "publisher" are stored as both text fields and keyword fields. This allows the book publisher to be searched as full text and also supports a publisher facet which will display the number of books in the database printed by that publisher. When data is stored in the "publisher" field, it will update both the text and the keyword parts of the field. Every minute that you spend doing system administration work to manage a database, an operating system or a server is a minute that you are not spending writing software and making your product better. Amazon Web Services offer a variety of "hosted services" for databases and Web servers. No system administration work is needed for an AWS hosted service beyond deciding when you would like a database software version to be updated. The Elasticsearch Search service runs a recent version of Elasticsearch and allows you to upgrade the version on demand. The example below shows a search query in the console pane on the left and the query result (in JSON format) in the right panel. 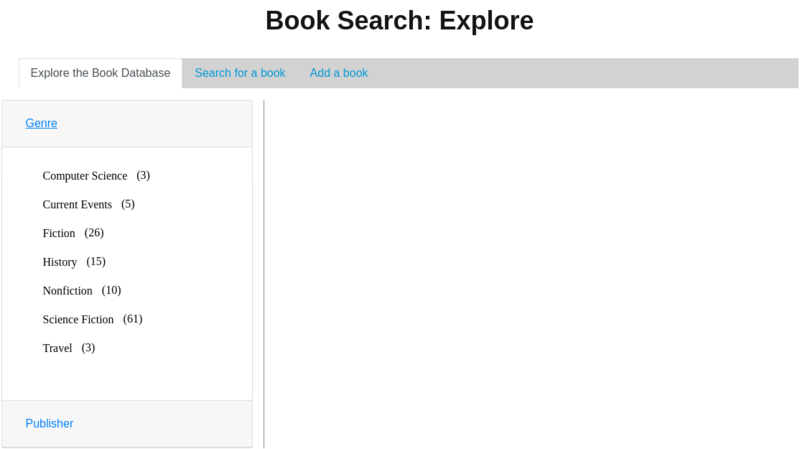 The Book Search application is designed to run with an Internet accessible Elasticsearch Service end-point. This makes debugging and testing easier and allows the Book Service application to run on either your local computer system or an Amazon Elastic Beanstalk server. As is the case with most AWS services, access to the Elasticsearch Service end-point can be "locked down" to a single IP address or an IP address range for increased security. Amazon has published documentation on how to build signed HTTP transactions based on the Apache HTTP Client. Unfortunately, this documentation can be difficult to find. The Book Search application includes AWSRequestSigningApacheInterceptor class which is at the core of these transactions. As with most AWS code, this class is published by Amazon as open source. The Java code below (available in the associated GitHub repository) shows how this class is used to build signed HTTP objects. The Elasticsearch Reference published on the elastic.co website. To run the application you will need an Amazon Web Services account and you will need to configure an Elasticsearch Service domain. You will also need to use Amazon's IAM service to obtain an ID and a secret key for Elasticsearch Service full access. The ID and key should be added to the IElasticsearch Java Interface in the code base. You will also need to add your Elasticsearch end-point URL to the Interface. The Elasticsearch version of the book search application expands on the Book Search application that uses DynamoDB with the addition of an "Explore" page that showcases some of the features Elasticsearch. The "explore" tab is shown below. This tab allows the user to explore the book database by genre or publisher. The "genre" accordion tab is expanded to show the book genres, with their associated book counts. The "Search for a book" tab allows the user to search by author, title or title and author. The DynamoDB application requires an exact author name or book title. Since this version of the Boook Search application uses the Elasticsearch database, partial author names or titles can be used in the search. For example, entering the word "venice" in the title search dialog will return the books with "venice" in their title.